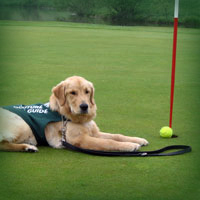 Ridgeway Lions will be holding their third annual Service Dog Golf Tournament Sept. 18 at the Fort Erie Golf Club. Funds raised will go toward the costs associated with providing the Lions Service Dog Program. Entry for the tournament is $70 and includes 18 holes with a cart, steak dinner and awards plus a $25 tax receipt. There will be a shotgun start at noon with hole contests, raffles, 50/50. Tournament and hole sponsors are also welcome as well as prizes and other donations. For information or to register, call Lion Bruce Schinkel at 894-2327 or email ridgewaylions@a2lions.org.